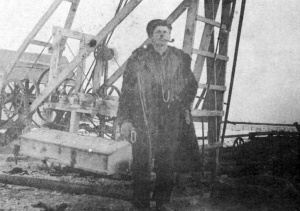 Cornelius K. Friesen in front of his drilling rig. Preservings photo. Cornelius K. Friesen: well driller and entrepreneur; born 11 September 1877 to Cornelius and Agatha (Klassen) Friesen in Blumenort, Manitoba as the fourth of seven children in the family. Cornelius K. Friesen grew up among the Mennonite pioneers who had come to Canada only a short time before his birth in 1874. His father was a teacher in Blumenort, Manitoba, and the children all had to help supplement the low pay teachers received. As a youth, Cornelius bought a bicycle and with his brother rode to Kansas for harvesting season. Normal travel back and forth between the Kleine Gemeinde settlements during the 1890s would have been by train. It was rumoured that the brothers had spend some time shooting out milk cans along the road with their pistols in order to drink their fill of milk and even raiding milk houses for supplies. Upon their return, the two were disciplined by their church with excommunication, a punishment usually revoked after a week or two, if contrite remorse was demonstrated. Cornelius and his brother had their church membership reinstated. In 1892, Cornelius K. Friesen began to work as a well driller, going from town to town offering his services. Although he initially worked with picks and shovels, he eventually designed a wooden drilling rig that made his work easier. He later patented what he called “The Artesian Well Tool,” a device used to maximize water pressure in pipes. His parents died in 1899 and 1900, and his siblings married and moved into their own homes. Cornelius waited longer than most men during his day to marry. In 1910 he married his cousin’s daughter, Katharina Friesen. With the drilling business continuing to develop the couple moved to Steinbach, where Cornelius had already acquired some property and built a blacksmith shop and house. Cornelius K. Friesen established Friesen Drillers in Steinbach, a company later continued by his sons and grandsons. With a successful business, Cornelius K. Friesen and his new wife were able to enjoy many amenities in their new home. The house he built in 1914 had a hot water furnace, running water and indoor plumbing, likely one of the first houses in Steinbach to have modern plumbing. Cornelius K and Katharina Friesen had ten children, of which all but the first two, survived to adulthood. Since the drilling business was successful, the family was also able to experience other firsts. During the winters, he would make a skating rink for his children and the young people in town. His was the first outdoor rink with lights, placing large coal oil lamps around the periphery which did the job and he charged a small fee to offset expenses. The C.K. 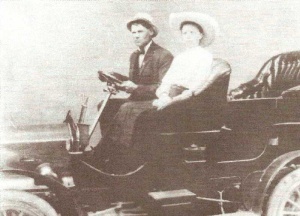 Friesens were possibly the first Steinbach family to go on frequent fishing holidays during the summer. When years of raising children were over, Katharina revived her long-held dream of continuing her education. Cornelius K. Friesen and the couple’s children were supportive, and in 1937, Katharina enrolled in the local Bible School held in the Mennonite Brethren Church. Although Cornelius received some criticism from other people in the community for allowing his wife to continue her studies, he defended his decision and maintained his support for Katharina’s ambitions. After suffering a debilitating stroke in 1946, the company was taken over by his sons John and Tony. He died on 22 September 1953. Cornelius K. Friesen left an ongoing legacy to his children and grandchildren, the most visible being Friesen Drillers, a company of which his grandsons took ownership in 1987, and a company in which his great grandsons also became active. GRANDMA (The Genealogical Registry and Database of Mennonite Ancestry) Database, 5.03 ed. Fresno, CA: California Mennonite Historical Society, 2007: #4154. Kehler, Glenn. “Well-Driller Friesen.” Preservings No. 15 (December 1999): 138-141. Huebert, Susan. "Friesen, Cornelius K. (1877-1953)." Global Anabaptist Mennonite Encyclopedia Online. December 2007. Web. 20 Apr 2019. http://gameo.org/index.php?title=Friesen,_Cornelius_K._(1877-1953)&oldid=94744. Huebert, Susan. (December 2007). Friesen, Cornelius K. (1877-1953). Global Anabaptist Mennonite Encyclopedia Online. Retrieved 20 April 2019, from http://gameo.org/index.php?title=Friesen,_Cornelius_K._(1877-1953)&oldid=94744.